We are on trip advisor! Please write a review and help us to get more visibility! 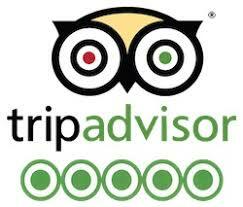 Here is the link: TripAdvisor. We will be back one more time for before the summer. April is packed with stand-up, musical comedy, burlesque and poetry. After a sold-out February show, tickets for our March show are already available online here. We have another fantastic line-up with stand-up comedy, cabaret and a drag king. MC as always: Alice Frick and on the sound-deck Catherine Allin, co-host of our Laughing Labia podcast. We will be back in February with fantastic female comedians and cabaret artist. This month we have a mixture of stand-up comedy, musical comedy, character comedy and cabaret - a night filled with laughter. MC will be awardwinning Austrian comedian Alice Frick and at the sound-desk for our podcast recording will be musician and producer: Catherine Allin. For our christmas special we have a cracking line up! The deluxe of the comedy and cabaret circus with a few christmas surprises. Hosted as usual by Alice Frick. Podcast recording by Catherine Allin. ​Tickets are available online here . Podcast Episode 2: What's your party goblin? After a sold-out season opening we will be back with an amazing line-up on the 4. November 2018. This month with Annabel Pribelszki, Jo Romero, Franziska Kissling, Pam Ford, Christina O' Sullivan and Stephanie Theobald. Hosted by Alice Frick. Podcast recording by Catherine Allin. Laughing Labia will be back on the 7. October. After a sold-out last season we moved to a bigger venue in the heart of London Soho with a cracking line up. This month with Eleanor Tierna,Lorna Shaw, Mara Mainka, Janet Bettesworth, Hannah Brackenbury, and Primrose Proper. Hosted by Alice Frick. After a sold-out season last year, we are very happy to announce that we will move to a bigger venue! We are looking forward to another amazing season! We are very happy to announce that Laughing Labia will be part of L-Fest 2018! More info about the show and the festival can be found here. Kate Smurthwaite, Romina Puma, Lily Philips, Valerie Savage, Carmen Ali, Madeline Campion, and Flo Go. Buy tickets at the venue (cash only) or online here. We are happy to be featured in the Diva Magazine. After a sold out October show we are back in November with other fantastic female performers. This month with a lovely guest MC, burlesque and magic legend Loretta von Dini who shares the stage with fantastic cabaret and comedy acts. We are more than happy to announce the dates for our new season! 2017/18 we will be back on the first Sunday of each month with a fantastic line up of female cabaret and comedy acts! Tickets will be available online two weeks before the show. ​If you have a group booking please email for discount options here. On the bill are: Claire Boyce Lenahan, Ginny Evans-Pollard, Cecilia Delatori, Jaycee La Bouche, Faye Treacy, Rebecca MossAlisa Evelyn, Anny Knight. On the bill are: Elf Lyons, Thanyia Moore, Heidi Regan​, Trudy Howson, Heidi von Swan, Madge Hooks with a lovely guest MC: Annabel Pribelszki! We are very happy to have the oldest female comedian on the bill, Lynn Ruth Miller, recently appeared on Channel 4's First Dates. Our last show was sold out - to make sure to get your ticket, buy it online here. We will be back on the 5. February 2017 with another brilliant line up, amongst others: Lynn Ruth Miller, the oldest female comedian who just recently appeared on Channel 4's First Dates. This time we also have a brillaint line up with stand up comedians, clowns, burlesque performers and musical cabaret. 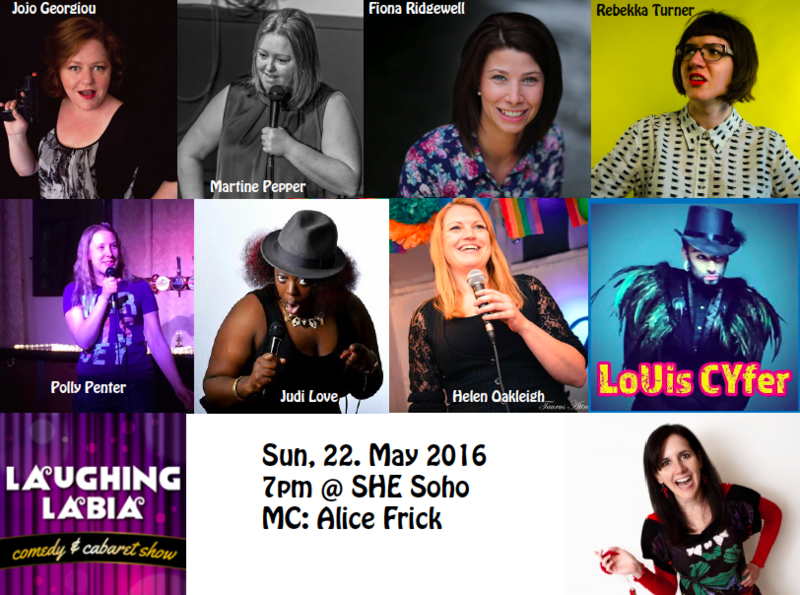 International and national funny women will guarantee a night of laughter. Laughing Labia will be back for another season! ​with an amazing line up, a mixture of comedy & cabaret artists! TICKETS ONLINE: please click here. In May we have again brillant performers: stand ups, drag kings, musical comedians, national and international ‪#‎ladytainers‬! This month we have again brillant performers: stand ups, clowns, musical comedians, national and international ‪#‎ladytainers‬! This month we have again brillant performers: stand ups, burlesque performers, clowns, musical comedians, national and international ‪#‎ladytainers‬! Laughing Labia is getting ready for the big relaunch! Let the Ladies entertain you! In February 2016 Laughing Labia will be part of the One Billion Rising Festival in London. The festival will be from the 7th to 14th February 2016 at The Bread and Roses Theatre in Clapham, produced by Goblin Baby Theatre Co.
One Billion Rising is the biggest mass action to end violence against women in human history. The campaign, launched on Valentine’s Day 2012, began as a call to action based on the staggering statistic that 1 in 3 women on the planet will be beaten or raped during her lifetime. With the world population at 7 billion, this adds up to more than ONE BILLION WOMEN AND GIRLS. More information are on this website. ​Laughing Labia has a new face! We have a great female comedy and cabaret line up, fantastic #ladytainers! Big opening day and relaunch party of Laughing Labia will be on the 31. January 2016 in London Soho! 28. February 2016, 7 p.m.
20. March 2016, 7 p.m.
22. May 2016, 7 p.m. Thank you for all the support and all the great comedians that performed in this season. If you want any information on the comics that performed please request them here. Every third Wednesday of the months the heart of Soho turns into a Comedy Club. Every time different comedians: international & professional! A comedy show for everyone: tickled labias and funny boners! Last season we had British acts as well as acts from Kenya, France, Italy and Denmark, the States, Austria and many more. We will kick the 2014 year off on 19. February 2014 with an amazing line up in a fresh and brand-new venue in the heart of Soho London! Laughing Labia @ Manchester "Women in Comedy Festival 2013"
Laughing Labia proudly presents two shows at the North West UK Women in Comedy Festival this upcoming October. A one hour comedy show with great international comedians.